The Corning Cable Systems Wall-Mountable Connector Housing (WCH) provides interconnect or cross-connect capabilities between the outside plant, riser or distribution cables and the opto-electronics. Available in two, four, six and 12 panels, the rugged metal housings can be wall-mounted in main cross-connects or telecommunication rooms. 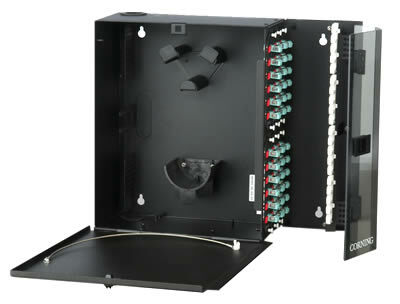 Units accept standard closet connector housing (CCH) connector panels and modules and options include jumper routing guides and a bracket for securing buffer tube fan-out kits. The cable strain-relief kit (WCH-STRNRLF-KIT) is designed for easier installation and the standoff bracket (WCH-STDOFF-BKT) extends the WCH from the wall to allow cable routing behind the housing. Brackets can also be stacked to increase the amount of space for routing. An optional field-installable lock kit is available for additional security.